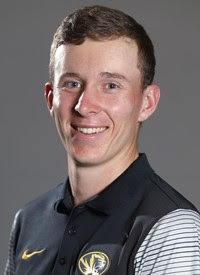 Ayrshire's Euan Walker, 22, will carry a five-stroke lead into Sunday's final 36 holes of the Battle Trophy four-round open tournament over Crail Golfing Society's Craighead Links. Walker, pictured when he played US college golf for the University of Missouri, shot splendid opening rounds of 68 and 67 for a nine-under-par tally of 135 which separated the Kilmarnock Barassie player from the good-class field. He had an eagle 2 at the 11 and birdies at the first, second, third, eighth and ninth, offset by bogeys at the fifth and seventh in halves of 35 and 33 for his second round. His nearest, albeit distant, challenger is Stonehaven's Scottish champion, Sam Locke who has had rounds of 68 and 72 for 140. A double bogey 6 at the fourth and bogeys at the 11th, 12th and 17th did not help his cause. Germany's Nicklas Blyth is in third place on 141 (71-70). Scott Crichton (Aberdour), first-round leader with a 67, slumped to a 76 second time round. He had two double bogeys. Players with 36-hole tallies of 149 and better qualified for the final two rounds. 135 E Walker (Kilmarnock Barassie) 68 67. 140 S Locke (Stonehaven) 68 72. 142 J Wilson (Balmore) 71 71, K Cantley (Liberton) 75 67, A J Sutherland (Cupar) 74 68, E McIntosh (Turnhouse) 70 72. 143 J Fox (Portmarnock) 71 72, J Johnston (Ayr Belleisle) 69 74, S Crichton (Aberdour) 67 76. 144 C Smith (unatt) 73 71, D Howie (Peebles) 71 73, G Dalziel (Airdrie) 70 74. 146 A Davidson (Charleton) 74 72, C Wilson (Castle Park) 75 71, A C Kyle (East Renfrewshire) 69 77, J Paterson (St Andrews New) 73 73. 147 J Wilson (Tyneside) 71 76, K Godsman (Moray) 74 73, J Morris (Glencorse) 71 76. 149 J Shaw (Boat of Garten) 72 77, B Murray (Portlethen) 70 79. 153 C Lamb (Newmachar) 80 73. 162 B Henderson (Deeside) 81 81.